Habit: Plant generally erect, thinly hairy. Inflorescence: bracts 2, awns straight, 0.2--0.5 mm; involucre 3--5 mm, 3-angled, 6-ribbed, teeth 6, 0.4--1.2 mm, awns 0.2--0.5 mm, hooked. Flower: 1, 2--4 mm, glabrous; perianth green-white to white or pale yellow-white, lobes entire; stamens 3, fused to perianth tube top. Fruit: 3--4 mm. Habit: Plant 0.5--3 dm. Leaf: blades 1.5--3(4) cm, 0.1--0.3(0.5) cm wide, tips acute. Inflorescence: involucre ribbed. Chromosomes: n=19--21(23). 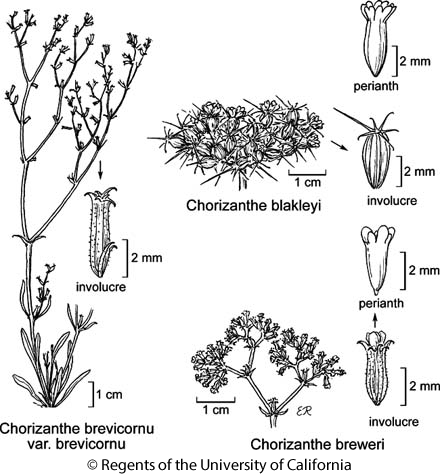 Citation for this treatment: James L. Reveal & Thomas J. Rosatti 2014, Chorizanthe brevicornu var. brevicornu, in Jepson Flora Project (eds.) Jepson eFlora, Revision 2, http://ucjeps.berkeley.edu/eflora/eflora_display.php?tid=56480, accessed on April 20, 2019.